Buy New Panasonic 25mm f/1.4 Vario Asph MEGA O.I.S. LUMIX G Lens (H-X025) Malaysia At FotoZZoom! Panasonic's Nano Surface Coating technology minimizes reflection at the entire visual light range (380nm-780nm) by applying the extra-low refractive index coating with nano-sized structure on the surface of the lens. It results in super clear pictures with dramatic reduction of ghost and flare. 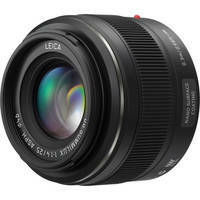 Panasonic's Leica DG Summilux 25mm f/1.4 ASPH Micro 4/3 Lens is designed for use with Lumix G Micro 4/3 cameras. It provides an angle of view similar to a 50mm lens on a 35mm or full-frame digital camera, and the wide f/1.4 maximum aperture can deliver beautiful, bright photos and videos with softly out-of-focus backgrounds. Built to Leica's usual high standards, this lens delivers excellent image quality with minimal distortion or chromatic aberrations, with a sturdy metal mount. Nano Surface Coating minimizes reflection over the entire visual light range, resulting in sharp, clear images with very little ghost and flare. The use of the Ultra High Refractive index lens and glass mold aspherical elements helps the lens maintain superb uniformity edge to edge. Seven aperture blades form a circular aperture for very pleasing out-of-focus areas in your images.